Nowadays if you hear someone deep breathing on the phone, its likely an obscene phone call. Back in the day though, you were likely to hear several at once. I remember when we got our first telephone, back in those days all of the island was on the Hickman’s exchange, so it was a 547 number, I remember that much, but I’ve forgotten the rest. 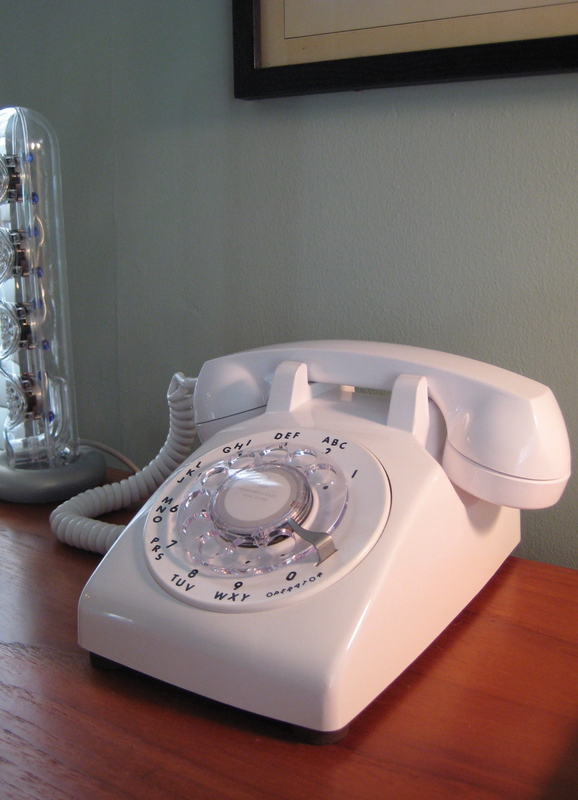 That first phone was of course about 20 pounds, and a rotary dial. I’m not sure if we got the white one right off the bat, or if we had the standard black, but I remember us having a white one most. Many or perhaps most people won’t know this, but years back very few people had a private phone, it cost a fair bit more money to have your own line, instead we were on a party line. That meant whenever anyones phone rang, so did yours. Each person had their own special ring assigned to the number, one long, one short, 2 short and a long, etc. Of course in small town anywhere, gossip is an art form, and these lines only added to that ability as people would listen in to catch all the juice. Everyone knew everyone’s business even more back then. To this day I think the name party line lingers on when we say “She’s such a gossip, her mouth is like a party line!” Yes yes, hang me for using she instead of he too if you want :P.
Some people were a little less capable of listening in than others. You had to wait till the right person had answered and pick up gently, and not snore into the receiver! Sometimes you couldn’t hear who was talking over others breathing. Not always being the politest of people to my elders, I remember yelling “Get off the phone” – of course some would make excuses and say they thought it was their ring, others would just anonymously hang up, and I’m sure the most brazen just stayed on the line. Later on we moved up in the world, with everyone getting semi-private lines; only 2 people sharing a line. I can’t remember if we heard each other’s rings now or not, but I do remember you’d hear a little dingle when the other person picked up. This didn’t, of course, stop listening in, but limited it at least somewhat. I’m really not sure how the gossip channels survived! I may be wrong, but getting these may have coincided with us moving to the Clarenville exchange, at least from Elliott’s Cove up. I am not 100% sure, but I think that was all at first, I believe Weybridge and Lady Cove moved to that exchange a bit later. Of course now we all have cellular phones, smart phones, and wireless, but the old party line will always be a memory of growing up. I remember our first phone it was the Crank Type, with seperate Ear Piece. I think there were only 3 or 4 Phones in Clarenville then. and we had one cause as my Father was a game Warrden and spent a Lot of time in Tug Pond, He had One there and we had one at Home, to Communicate and for emergiencies.